If you are someone who is on the fence about whether your family wants to introduce the concept of "Santa" to your children, this post is for you. 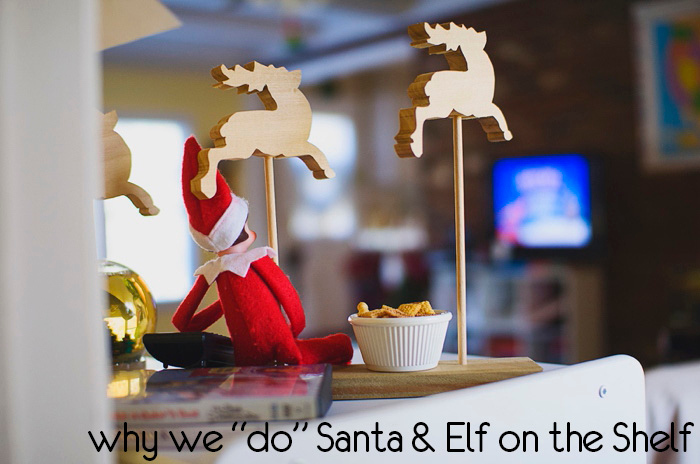 I wanted to share what our Elf, Jolly, did for our 2012 Christmas season. But first, let me explain why we do Santa. 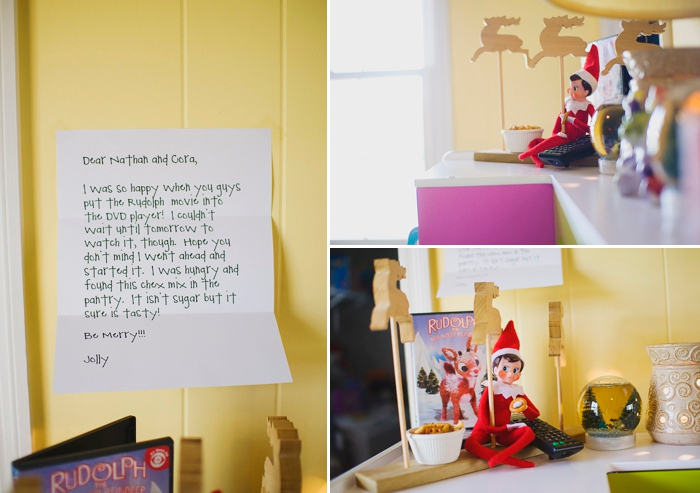 Our Elf on the Shelf tradition is one of my most favorite things we've done with our children. It has inspired within them a love of things whimsical, fun, unexpected, and magical. I'm fairly certain my oldest child, who is incredibly analytical, logical, and just plain thinky, has put two and two together. He knows it isn't possible that there is a Santa. He knows that tiny elves who do stuff aren't real. He's very much aware of what is fantasy and what is reality. But all the same, his little 7 year old self embraces wholeheartedly the magic around our Christmas season. He wants to prolong the fun. Did you see what writer Refe Tuma said about his creation of Dinovember? Read the whole post here. I love what he says at the very end. “Why do we do this? Because in the age of iPads and Netflix, we don’t want our kids to lose their sense of wonder and imagination. In a time when the answers to all the world’s questions are a web-search away, we want our kids to experience a little mystery. All it takes is some time and energy, creativity, and a few plastic dinosaurs. I could not agree more!!! I value imagination so, so, so much. Their sense of wonder is so important. I do not want to be the reason that their flame of imagination dies out. I want to inspire their imaginations, and I want their home to be a place that is always, always filled with FUN and fond traditions. To engage their imaginations now is to awaken their sense of wonder and prepare it for bigger and better things as they grow. Christmas is about the birth of Jesus in our family. That is the entire point. Yet, our children are young. 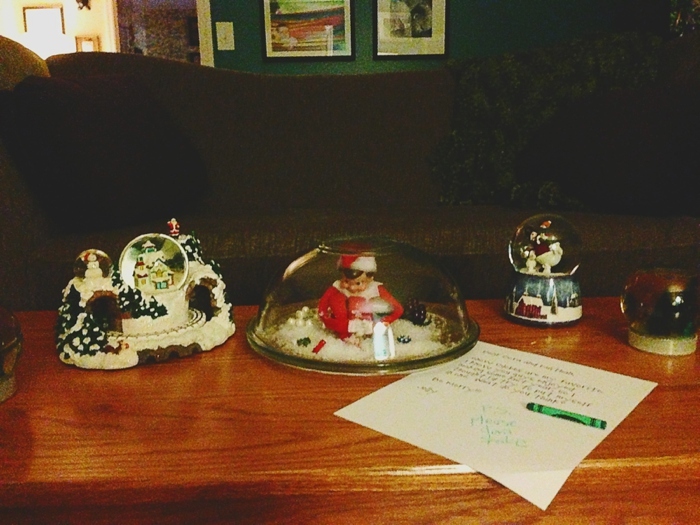 While they are little, we chose to embrace Santa and welcome him into our home. I understand why those who choose to deny Santa do - the trouble with lying to your children, and the focus on stuff instead of Jesus. Yet, we've decided to embrace this tradition. Here is why. Santa is a symbol for Jesus, to me. Just as a wreath is a symbol of God's love, because a circle never ceases just as God's love never ceases. Just as we give gifts, as a symbol of the gift of Jesus to us from God, and the gifts that were given to Jesus by the wise men. 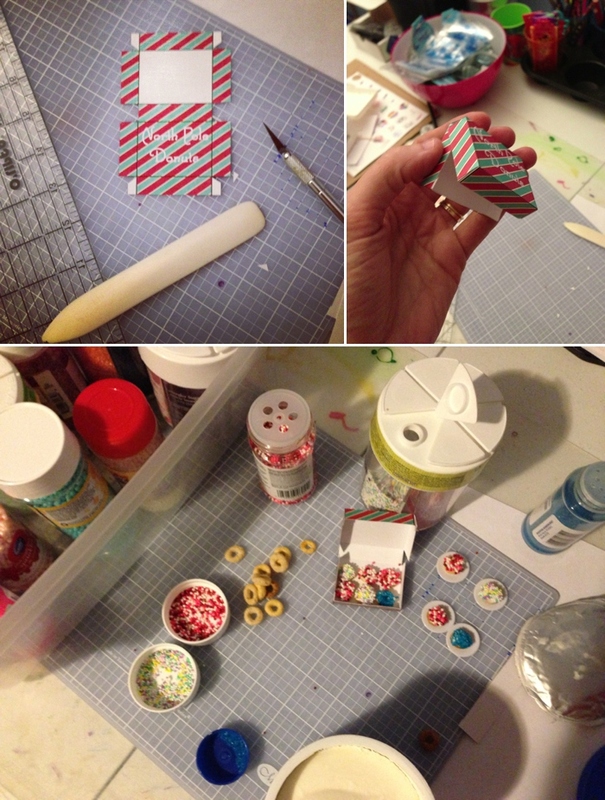 Just as the candy cane is a symbol of the Shepherd's staff, who first noticed the star when Jesus was born. Just as the Christmas Tree is a symbol of hope and life, because it is an evergreen that does not loose its needles over the winter and promises that the rest of nature will reawaken in Spring to new life, just as Jesus gives us hope and ever lasting life. a celebration of the birth of Christ, who came to save the world from the consequences of their brokenness. Santa loves and gives unconditionally (in our family we have no naughty or nice list), just as Jesus loves us and came to ultimately give us the unconditional gift of grace. Santa is meant to point our children toward Jesus, not detract or distract. The things that attract us to Santa, are the same things we love about Jesus. There is a parallel. Santa is a tangible concept that young children can comprehend. And he teaches them to believe in something they've not seen, not heard, and not touched. Santa points toward a bigger truth, that their young minds aren't fully ready to grasp. And yet, there is still mystery surrounding Santa. The things he does seem impossible. I want them to wrestle with the concept that they cannot make sense of every little detail. I want them to come to grips with the fact that they don't have to understand it all, to be the recipient of his blessings. Not all children are the same. But I do feel this belief in something he couldn't see, feel or touch, has been a blessing to my son. His analytical, logical, processing mind from the early age of 2 would give me unanswerable questions about God. "But WHY can't we SEE him? Why can't see SEE heaven? WHERE is it? " He just wouldn't let up. And at 2, 3, 4... he didn't have the intellectual development to handle the answers. He could not reconcile it. But I must wonder if Santa helped to bridge the gap. He's never seen Santa. He's never spoken to him or heard his voice. He's never touched Santa. But he knows, or at least knew for a time, that Santa still existed. It helped him draw connections in his head while he needed them. That there are things in this world that are, without our need to see, feel, hear. has been a most wonderful addition to our Christmas festivities. He has helped my children, who tend to be very "stuff" focused by nature, broaden their concept of Christmas. The magic of Christmas to my young children hasn't been just about Santa and presents. 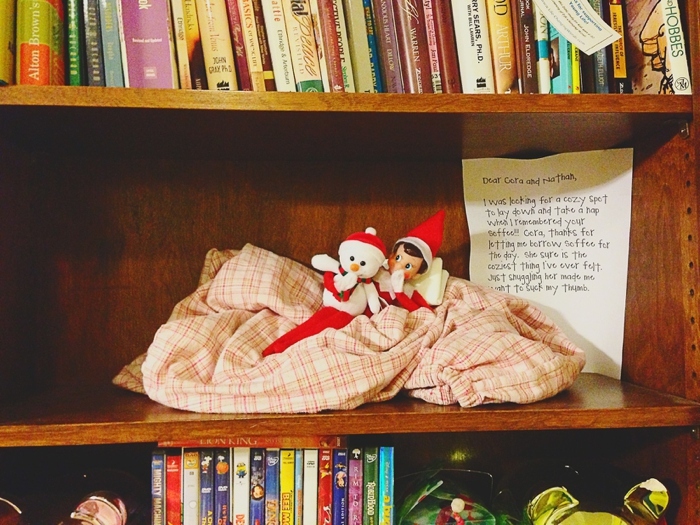 It has also been about the antics of our elf. It has done my heart good to see them enjoy Jolly, look forward to what he'll do next, and be less concerned about what Santa will bring them. Yes, I want them to ultimately understand that Christmas is only about Jesus. They know that, in their heads. I hope this helps them shift into that appreciation as they grow up. I hope that the way they feel about our Christmas magic transfer over to how they feel toward Jesus, as they become intellectually able to grasp the mystery of Jesus and just what a gift He has given us is. And it has done my own grown up, distracted, responsible, anxiety-girl heart some wonderful good to take the time to focus on FUN during our Christmas season. It has been a tangible thing that reminds me each year how important traditions and fun are to them, and how good to makes me feel when I stop being so task oriented and just have fun for a bit. While I value cultivating their imaginations, life does get the best of me. 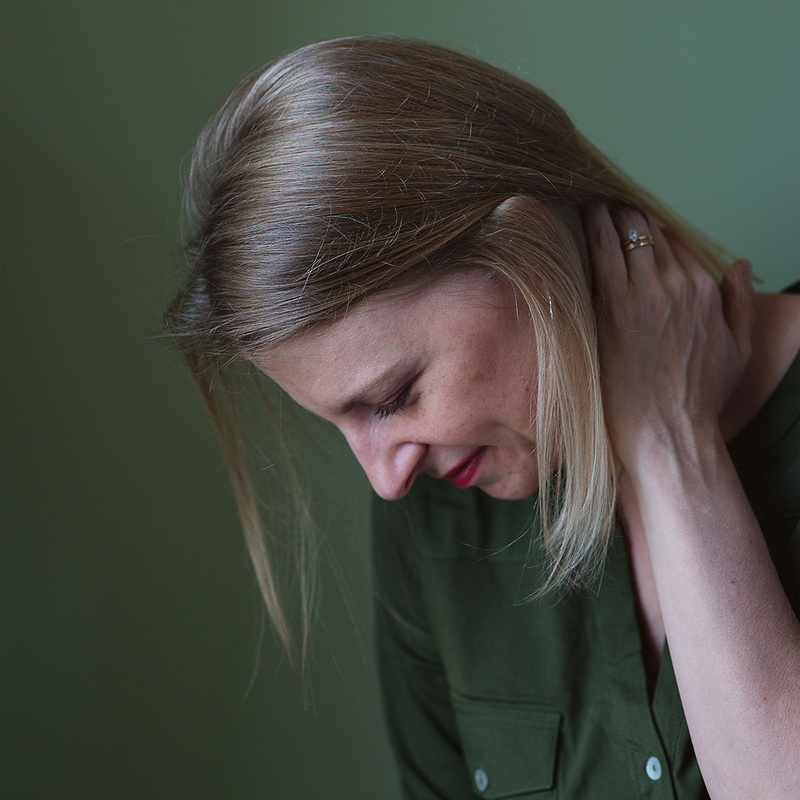 I get boggled down by burdens and to do lists, often. I look forward to permission to focus on fun. Now, for last Christmas's Elf on the Shelf antics. I bit off a little bit more than I could chew last December. Let's just say, the "photograph your elf every day" project crashed and burned. These were the ones I managed to photograph. And then a few days in, it just switches from my real camera to my iPhone. That's okay. The memories are still there, and that's really the point. 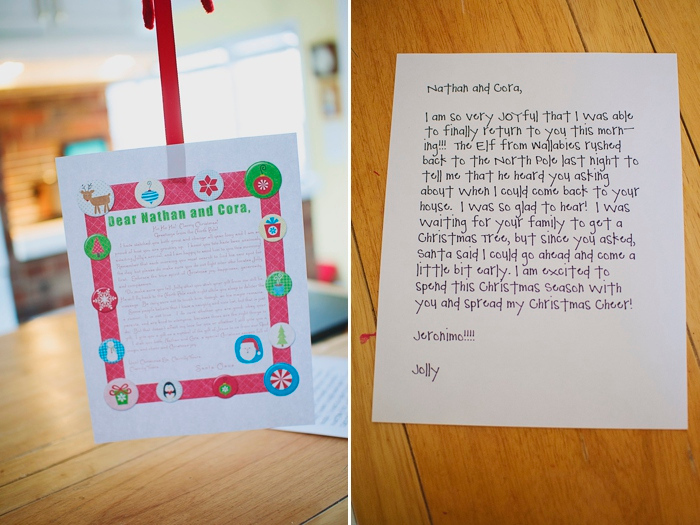 Jolly always parachutes to arrive, and brings a note from Santa and himself. I loved this idea I found on Pinterest, of putting Jolly in his Lighting McQueen bedroom slipper. 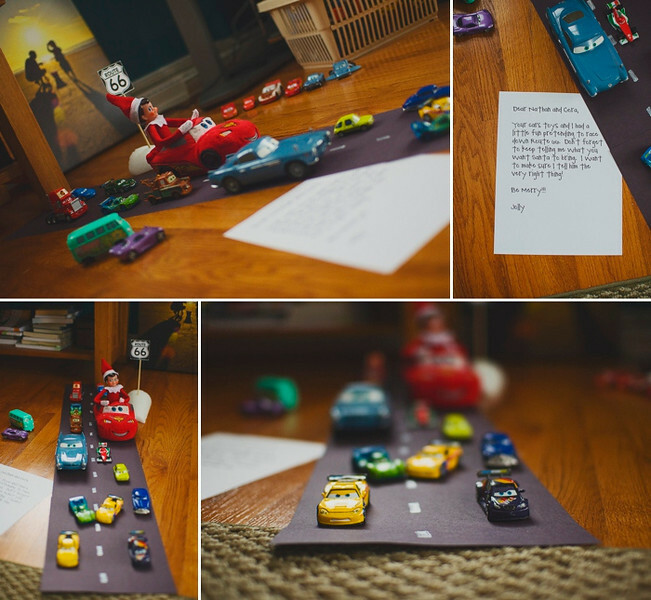 I enhanced it with a paper road and the rest of his Cars cars. They LOVED this one. After watching us bake copycat Starbucks Cranberry Bliss bars all day, he couldn't resist having one himself. Especially since the kids had wanted to share it with him. 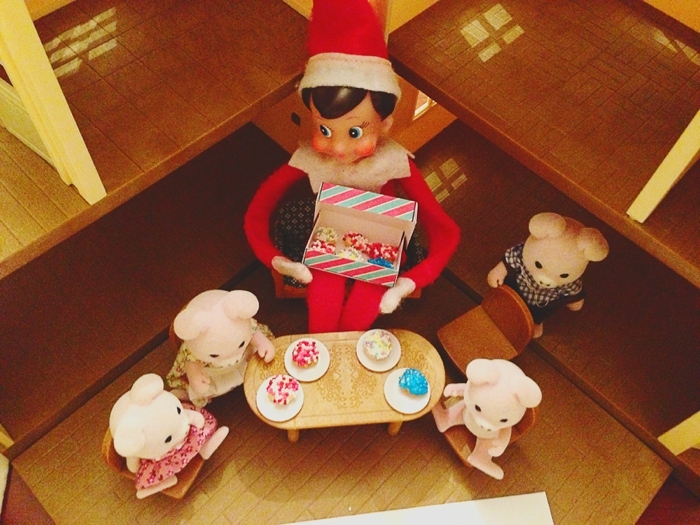 He loves to watch movies that are associated with his friends at the North Pole. 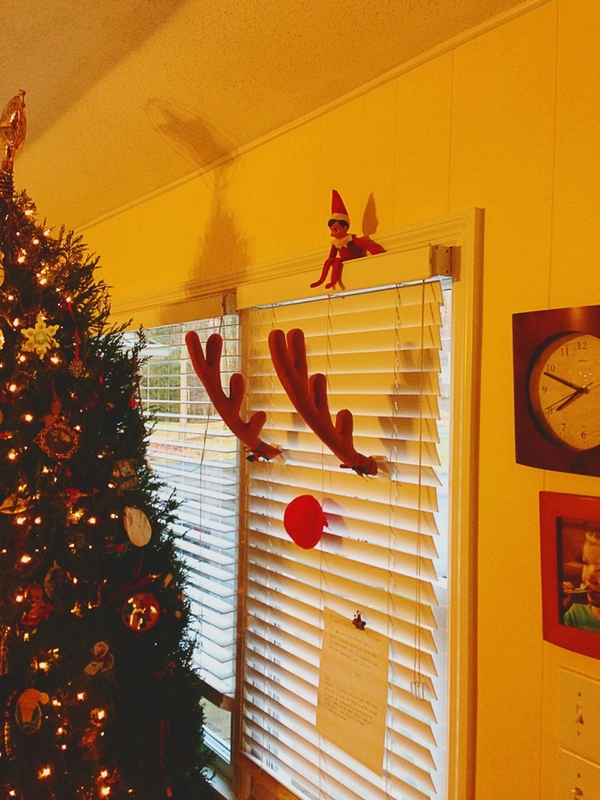 Jolly gets to ride the airplane in my son's room to the North Pole each year, getting a "night off" from flying. Jolly borrowed my daughter's special blanket, because he needed something to snuggle with. He made himself into a snow globe. I thought this was awesome. They were not so impressed. He donned a pair of reading glasses and read from the Jesus Storybook Bible to all the stuffed animals. Can't you see they are rapt with attention? Jolly brought them car Rudolph antlers. They LOVED this. I mean, they LOVED it. Imitation Elf Ice Cream? 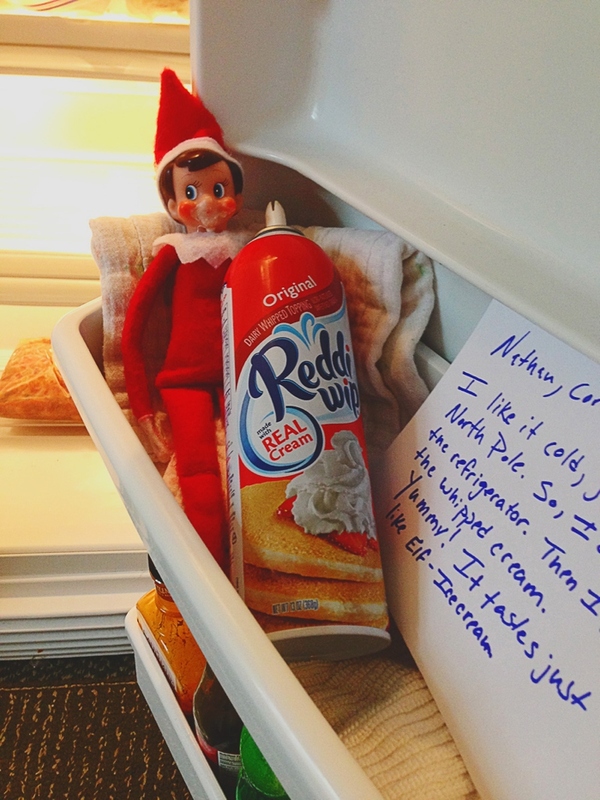 Apparently Reddi Whip fits the bill. 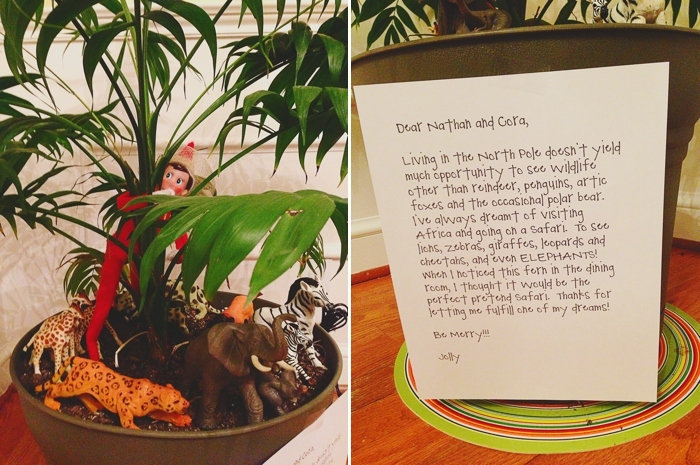 Jolly has always wanted to go on a Safari, but the North Pole hasn't afforded such a luxury. He had to take advantage of the fern and the jungle animals. Can you see his little safari hat? 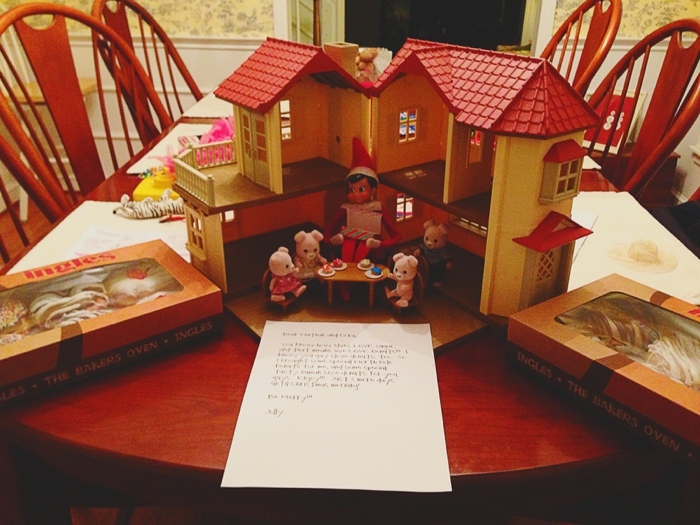 He brought the kids real donuts, and had elf donuts with the Calico Critters. I made the box template in photoshop and cut it out with an exact knife. I dipped the cheerios in frosting and then in sprinkles. super easy. 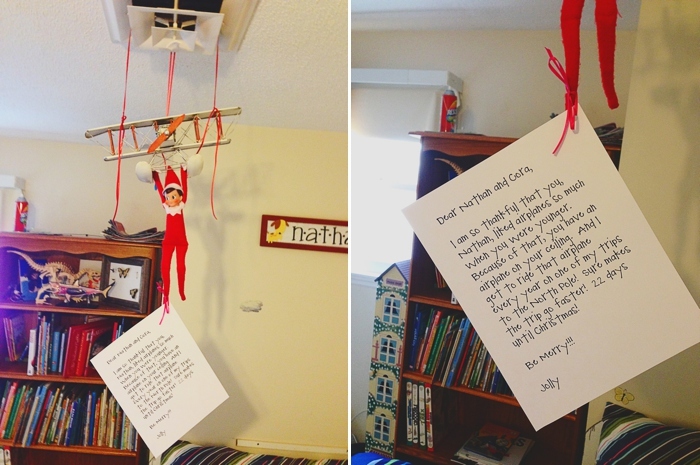 He took a spin down the stairs via a roll of toilet paper, and left them some elf jokes. 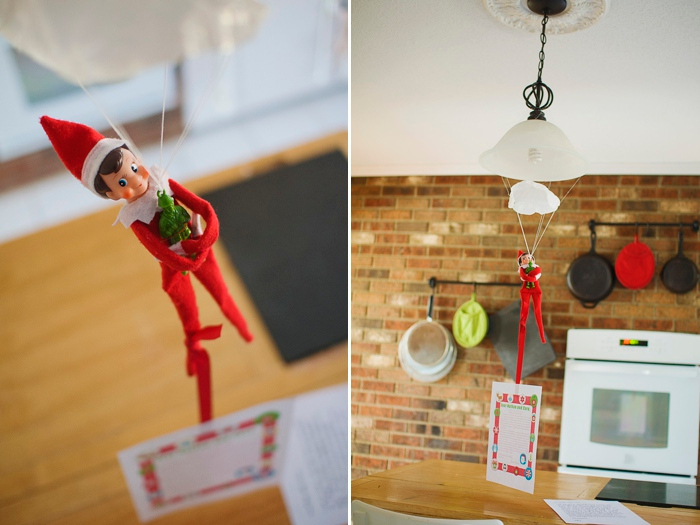 I am super excited to have a whole new year of Elf on the Shelf antics. Anyone have a suggestion of what we should do?